A unique color and image is used to visually identify each dimension. Download them from the visual language section of the Discover to Deliver resources site. 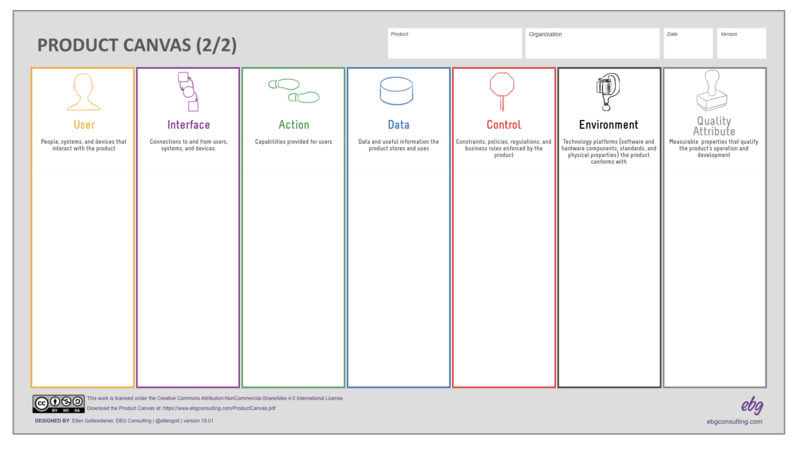 Use visual models where possible to enhance and enliven conversations in Product Canvas and product discovery workshops. Models also help reviewers understand the essence of any given product dimension, quickly. I provide examples of useful visual models in the explanations below. Remember to keep the models for the Product Canvas coarse-grained, not detailed. User Dimension: Users value, benefit from, and directly interact with the product. Users trigger actions and can receive data from the results of actions. Include people, systems, and devices that interact with the product. In addition to listing users, represent them on your canvas with personas, roles maps, empathy maps, and customer journey maps. Canvas User Dimension tip: Users (people, systems, devices) that interact with the product. Interface Dimension: This represents the connections the product needs to interact with all its users, systems, and devices. Interface mechanisms can be human-computer (e.g., visual interface, touch, audio, or facial scan), system-to-system (via APIs), and messages (how the product interfaces with devices or systems). Visually represent interfaces using a context diagram or relationship map. Canvas Interface Dimension tip: The product connects to and from users, systems, and devices. Action Dimension: This specifies what the product does for its users. Name the actions at a high-level with, for example, features, capabilities, or functional names ending in “ing” or “ment” (e.g., invoicing, fulfillment). 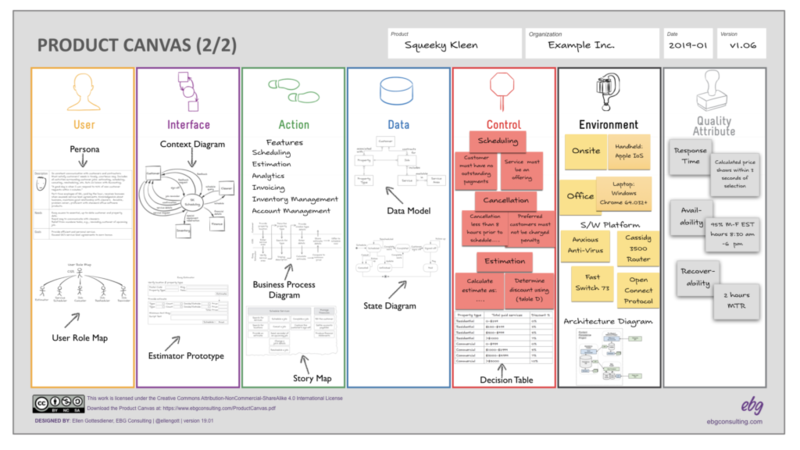 Supplement the list with visual models such as an experience map, story map, business process diagram, value stream map, dependency graph, service blueprint, or capability map. You can also use text-based scenarios or jobs-to-done for the Action dimension. Canvas Action Dimension tip: The product provides capabilities for users. Data Dimension: This represents the persistent data the product stores and uses. This includes data needed by actions and which is sent and received via product interfaces. List them using domain nouns (e.g., data entities such as Customer, Payment, or Property). Better still, visually communicate the Data dimension with a conceptual data model. Important lifecycle changes of important data entities can be visualized with a state diagram. Canvas Data Dimension tip: The data and useful information the product stores and uses. Control Dimension: Identify the policies, regulations, and business rules that the product must enforce. Controls originate from the business itself, from external sources such as regulatory bodies, or both. Include controls that are enforced in the product via software or hardware configuration, manually through business processes, or both. Canvas Control Dimension tip: Specify the product constraints that need to be enforced such as policies regulations, and business rules. Environment Dimension: Clarify the product’s technology platforms (hardware and software) and, if it is a physical product, its physical properties. Don’t forget to include standards the product must conform to, as well as the product’s environment of use. For example, a software product’s user might be located in an office using a limited set of devices (e.g., desktop, mobile) with a limited set of browsers and operating systems. If the product is a system comprised of both hardware and software, you need to identify physical aspects of its usage environment. A technician may be holding the product in their hand, in the cold and rain, using gloves. The Environment dimension identifies constraints on your product’s design and implementation options, thus it is visually represented as a vise (also doubling as a provocative question mark) constraining the product box. Canvas Environment Dimension tip: The product conforms to physical properties and technology platforms— software and hardware components and standards. Source: EBG Consulting: Metamodel of Quality Attribute Dimension Canvas Quality Attribute Dimension tip: Quality attributes are predefined levels of service for the product’s functionality and Interfaces. These should be measurable properties that qualify the product’s operation and development. Because the Product Canvas is a tool to build shared understanding, the best approach for building the Product Canvas Part 2 is in facilitated workshops with customer, business, and technology representatives. As with Product Canvas Part 1, always prepare before your collaborative Product Canvas session (a.k.a. facilitated workshop). Consider creating draft models for some of the dimensions in mini-workshops with a subset of participants prior to the larger workshop. You can work on both canvases together or split the work into separate sessions. If there is a diversity of opinion on what your product is, I recommend starting creating Product Canvas Part 2 to gain agreement on the gist of the product. This is because it is difficult to tackle the higher level blocks in Product Canvas Part 1 without shared agreement on what the product does, for whom, and how. Product Canvas Part 2 helps you do just that. Keep it High-Level. Clarify that you are looking broadly at the product, not depicting fine-grained aspects of the product. For example, for the Data dimension you are not listing data attributes such as “resident street address” or “job schedule date”) but rather big chunks of data such as “Customer,” “Property,” and “Job.”The initial intent is to have the canvas depict the “as is” product. If you want to include “to be” aspects, I recommend denoting them as such with a note (e.g. “to be” or “planned for Q1 2010”). 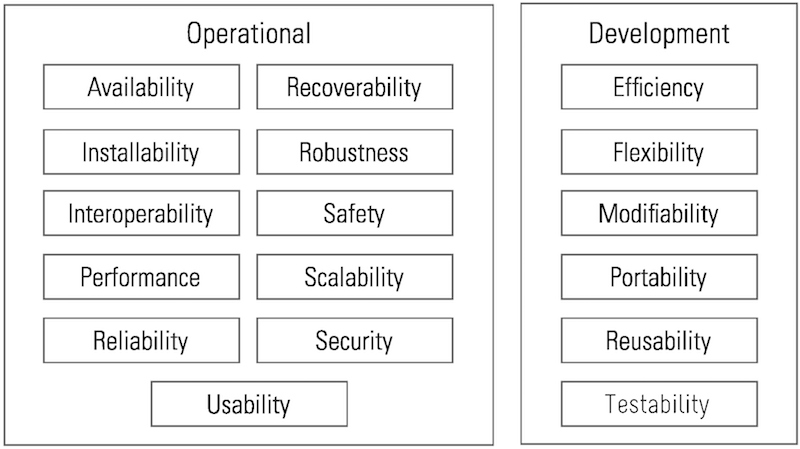 For example, for a transactional product (such as ordering, billing, or managing inventory), I might start with the User dimension, move next to Action, then Data, and continue onto the other dimensions.For an analytic or configuration product, I recognize that data and business rules are crucial. I prefer identifying the key data domains (Data), then shift to Action by asking about the questions, queries, or decisions that need to be made by the product. This navigation strategy, in turn, provokes uncovering business rules (Control dimension) that must be enforced.For platform or infrastructure products, I am likely to start with the Environment dimension and then navigate to the User and Action dimensions. 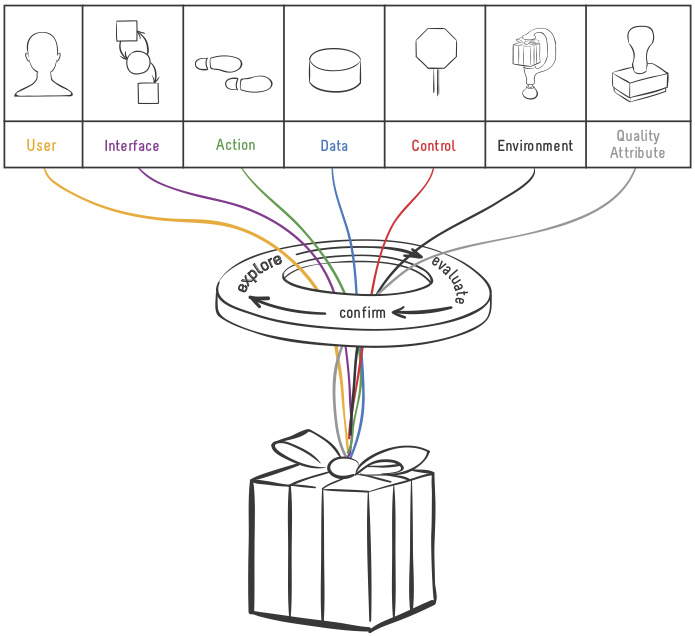 However, for some products, I’ve found using a context diagram (useful to define the Interface dimension) helps pull participants back into a broader product perspective to give them a birds-eye view of the product. From there, I navigate to the other dimensions.All seven product dimensions weave a multi-colored and multi-dimensional tapestry that makes up your product. One dimension informs another. 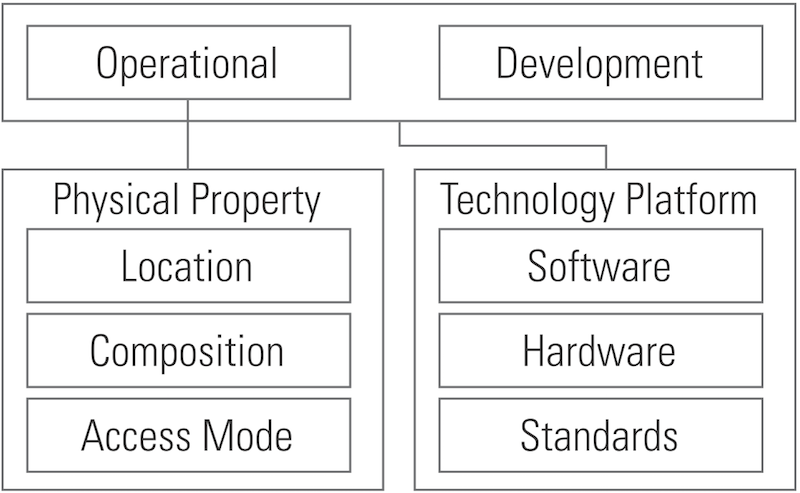 A feature listed in your Action dimension operates on data (Data dimension) enforces business rules (Control dimension), is used by a user (User dimension) connected via an interface (Interface dimension) on some hardware and software platform (Environment dimension), and requires a level of performance and security (Quality Attribute dimension).Regardless of where you start and the sequence of navigating across the product dimensions, you need them all to get the full picture. Make it Visual. Use a variety of ways to express your product’s dimensions, including visual models, and text descriptions. Supplement the text with visual models (e.g., data model for the Data dimension, role map for the User dimension, and experience map for Action dimension). Still, it is a good idea to select the minimum combination to not overwhelm participants with too many models. Reflect and Retrospect. Post the completed Product Canvas for internal review and share it with a broader audience. Then, share it with your customers (remove any sensitive info for commercial products, such as your competition sections in Product Canvas Part 1). Do they quickly and easily understand it? What might be missing, conflicting, or erroneous? Seek ways to improve the quality of the content of your Product Canvas. Reassess your Product Strategy Roadmap. Consider using tools such as the Four Actions Framework and the companion Strategy canvas. Pay particular attention to your Action, User and Environment dimensions to consider factors (or product dimensions) you might rise above standard, reduce (due to excessive competition), eliminate from competition or create. You can also use the Kano model, value proposition canvas, or exploring different market segments. Consider Product Backlog Implications. Product Canvas Part 2 identifies the essence of the product: its composition and what it does and for whom. You can derive any backlog item from it, and visa versa. Indeed, using the 7 Product Dimensions helps avoid a bloated backlog and is a powerful tool for slicing (a.k.a. “splitting”) backlog items.Reassess your backlog in light of your strategic reassessment. As a product person, ask yourself questions to optimize your product content as well as your product management practices. Is your backlog and difficult to manage? Do you share and use transparent prioritization criteria? Are you considering the relevant factors needed to make value-based decisions for your product? Are you using transparent decision-making rules? Do you build trust in your product community? Make it a Living, Go-To Tool. Decide how to keep your Product Canvas alive and well. At a minimum, bring it forward in your ongoing roadmapping and backlog refinement sessions. 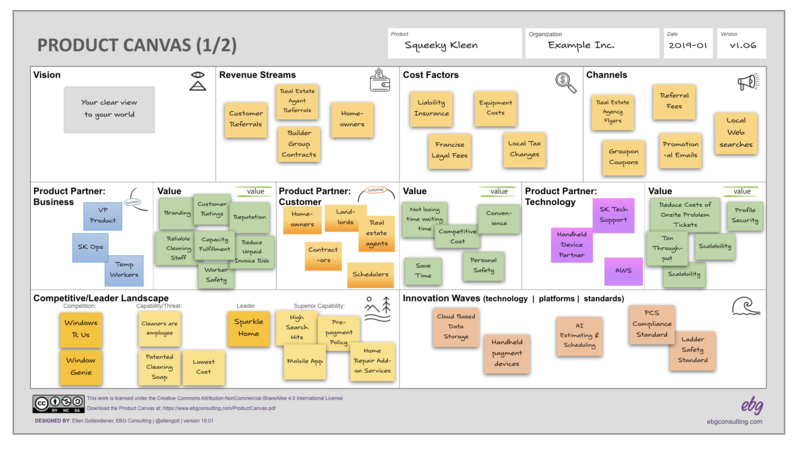 The purpose of the Product Canvas is to align product managers, product owners, product development teams, and associated organizations with a shared understanding of their product. Feed your product strategy and tactics with it. Use it to onboard new people, set content for product planning and discovery, and as a tool for shifting toward becoming a product-focused and customer-centric organization. The collaborative process used to create and maintain the Product Canvas is its most valuable benefit. Download the Product Canvas here. Please share your experiences, comments, and suggestions by emailing me at ellen@ebgconsulting.com. Gottesdiener, Ellen and Mary Gorman. Discover to Deliver: Agile Product Planning and Analysis. EBG Consulting. 2015. http://www.discovertodeliver.com/download.php. Kim, Chan W and Renée Mauborgne. Blue Ocean Shift: Beyond Competing – Proven Steps to Inspire Confidence and Size New Growth. 2017. New York: Hachette Books, 2017. Glad you find it useful. Please let me know questions, ideas, things that worked (or didn’t) as you make use of the Product Canvas.